ST. GEORGE — A driver who told police he didn’t see another truck in front of him collided with the oncoming truck that was, in fact, there. 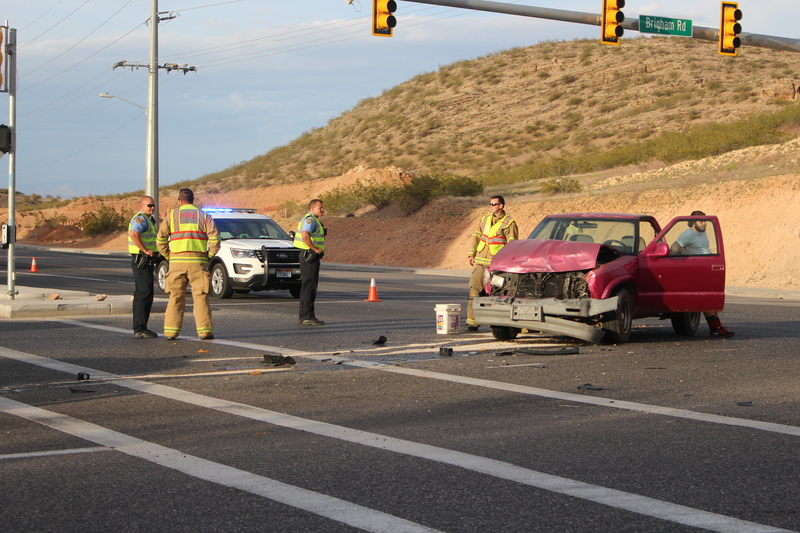 St. George Police responded to the collision at approximately 7:08 p.m. Monday evening at the intersection of Brigham Road and River Road. The driver of a gray full-sized GMC pickup truck on Brigham Road made a left turn to go north on River Road when he collided with a Chevrolet S-10 pickup truck that was going south on River Road, St. George Police Lt. Doug Sargent said. Medical personnel from Gold Cross Ambulance arrived on initial report of injury. The driver of the GMC was cited for failure to yield, Sargent said. The GMC was still in drivable condition following the crash, but the Chevrolet sustained heavy damage to its front end and was towed away. Responders from St. George Fire were on hand directing traffic and cleaning up the wreckage. Traffic on Brigham Road was limited to turning right to go south onto River Road because the left turn lane leading north was blocked by emergency vehicles and the disabled Chevrolet for about 30 minutes. How long can city officials not take needed steps for improved safety on our streets? Better signage, stripping, larger traffic lights & stop signs and motorcycle patrols all come to mind. I guess lawsuits for what’s NOT being done will catch officials attention and then public safety, everyday driving around town safety, will take it’s proper place in city priorities. That sounds like a lot of work Not_So_Much. I say we publicly shame people who text and drive or give large fines for those who do ANYTHING other than driving while driving. Right now you pass the buck by blaming it on the gov’t. My guess is that this idiot was on his cell phone. Anyone check his phone records?